Today, pupils at Kings Road Primary School have an opportunity to buy the products that were produced during the excellent Enterprise Week. 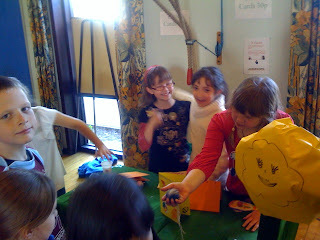 Here is The F Factor stall, with our sales team behind, selling Grow Your Own Sunflower kits, Easter Cards and Pom Pom's. Much of what was made is now 'sold-out', which should be good for our business model! I'm looking forward to the evaluation session, looking at what worked well and what didn't work so well. Sugababes - Rave on ...!